When the weather is frightful and you can’t seem to escape the chill in the air, there’s nothing better than cozying up and sharing a warm drink with the ones you love. Just in time for this holiday season, we whipped up three hot chocolate recipes featuring delectable delights all served in the perfect Disney Store mug. Dig out the marshmallows, shake up the cream, and get ready to brew some hot cocoa the Disney way! Note: Because of their popularity, some items might become unavailable. Get inspired with the ideas below, then visit Disney store or shopDisney.com where you’ll find a wide selection of fun mugs to create your own masterpiece. You won’t find rebel scum anywhere near this Imperial Scout Trooper Mug or this Stormtrooper Mug with a crack squadron of marshmallow TIE fighters on patrol. Being bad sure tastes good. Use icing to adhere thin chocolate wafer cookies and marshmallows to create bite-size TIE fighters. Split a full size cookie and use a toothpick to etch a matching trooper helmet design. 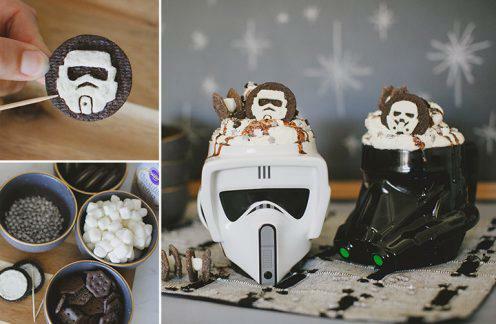 Succumb to the dark side by making your favorite dark hot chocolate recipe. Add finishing touches including a dollop of whipped cream, a drizzle of dark chocolate, and a burst of star sprinkles with cookie crumbs. Remember to send your troopers and TIE fighters out on patrol. If you can’t beat the cold, you might as well join it. This frozen hot chocolate recipe flips traditional hot cocoa on its head. Queen Elsa would be proud. Chill your Elsa Glass Mug and Anna Glass Mug in the freezer. While you wait, bake snowflake sugar cookies and pipe snowflake detail with white icing. 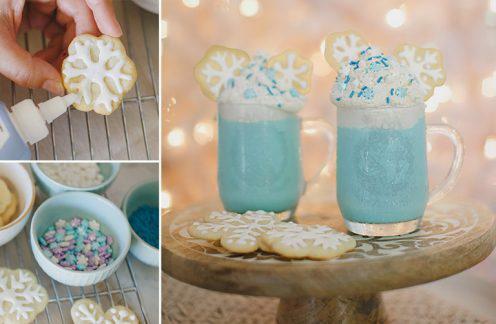 Make your favorite white hot chocolate recipe, then add a drop of turquoise food coloring. After it cools, blend with ice. Pull your Frozen mugs out of the freezer and pour in the iced cocoa. Add a mountain of whipped cream capped with an icy blast of sprinkles, iridescent glitter, and snowflake cookies. The cold never bothered you anyway! ¡Delicioso! Läcker! Délicieuse! 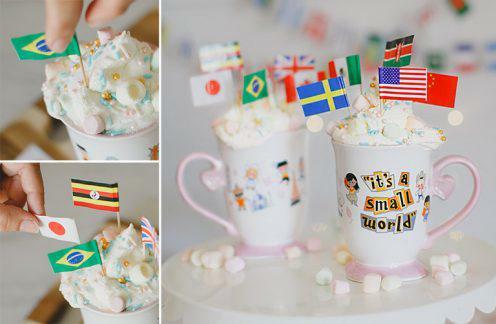 If you like your cocoa to warm not only your tummy, but also your heart, the “it’s a small world” mug is perfect for you. Just add a little international flavor! Find a new-to-you international hot chocolate recipe such as chai, Mayan, or Italian. Top it with a snowy-white glob of whipped cream, then add rainbow marshmallows and confetti sprinkles. Garnish with toothpick flags from countries around the world. It’s a small world after all! Whether you like your cocoa hot, cold, plain or overflowing with added goodies, Disney store’s selection of themed mugs makes it easy to find one to warm up with. Remember that Disney® Visa® Cardmembers save 10% on select purchases at Disney store and shopDisney.com.1 That means everyone on your couch can find the perfect mug and still have enough left for a matching blanket.